AIDS-associated Kaposi's Sarcoma (KS) is an increasing public health problem in KwaZulu-Natal, South Africa. The optimal management of AIDS-associated KS in sub-Saharan Africa is unknown. NCT00380770 is a single center randomized clinical trial of 112 patients with AIDS-associated KS who received a nivirapine based antiviral regimen (ARV) alone, or with chemotherapy (doxorubicin, bleomycin and vincristine) between 2003 and 2007. We evaluated 1-year overall survival (OS) and the ACTG staging system in our study population. Baseline TIS staging information is available for all patients. One-year survival data is available for 105 study subjects, with only seven subjects lost to follow-up. OS was evaluated using Kaplan-Meier hazard function methodology. 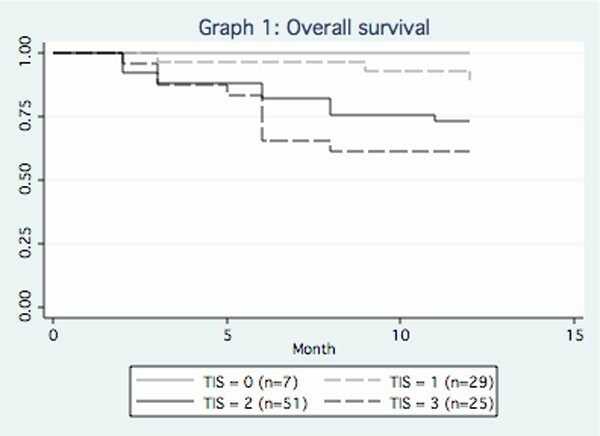 Survival functions were generated for subjects with 0, 1, 2 and 3 adverse prognostic variables using the modified ACTG TIS staging system (CD4 cut-off = 150). Univariate and multivariate Cox proportional hazard regression was performed to evaluate the prognostic value of individual and combined variables on OS in the study cohort. Survival analysis was performed with Stata 10 for Macintosh. Baseline characteristics are listed in Table 1. One-year OS in the overall cohort was 76.6 percent. For subjects with 0, 1, 2 and 3 adverse prognostic risk factors, the one-year OS was 100 percent, 89 percent, 73 percent and 61 percent (Figure 1). Results from univariate and multivariate Cox proportional hazard regression analyses are listed in Table 2. For the Cox proportional hazards regression model including T, I, and S, the LR χ2 (3) = 8.45, with p = 0.0375. In NCT00380770, 1-year OS in a cohort of AIDS-associated KS subjects in a resource limited setting is dramatically improved compared to historical sub-Saharan cohorts prior to the availability of ARVs. The ACTG Staging system is clinically useful in resource-limited settings. It is notable that for 86 percent T = 1 disease and universal ARV use HIV-associated systemic illnesses, which included 15 subjects with tuberculosis, is the most significant prognostic factor. Analysis of response rates, overall survival, adverse events, and quality-of-life between the two arms in NCT00380770 is ongoing.